The Girl And Her Camera: Persimmon: The Fruit That Nobody Wants? Persimmon: The Fruit That Nobody Wants? These were the persimmons my husband went and purchased from a village near Pauri town. In 2015, when we were still in Khirsu (about 20 km. from Pauri town), we were able to purchase persimmons from a local fruit shop, Himalaya Fruits at Agency Chowk. Of all the fruit shops in town, only this guy had persimmons. So upon buying, talks came up as to how we knew the fruit to asking where did he (the shopkeeper) get the fruit. Locally, he replied. 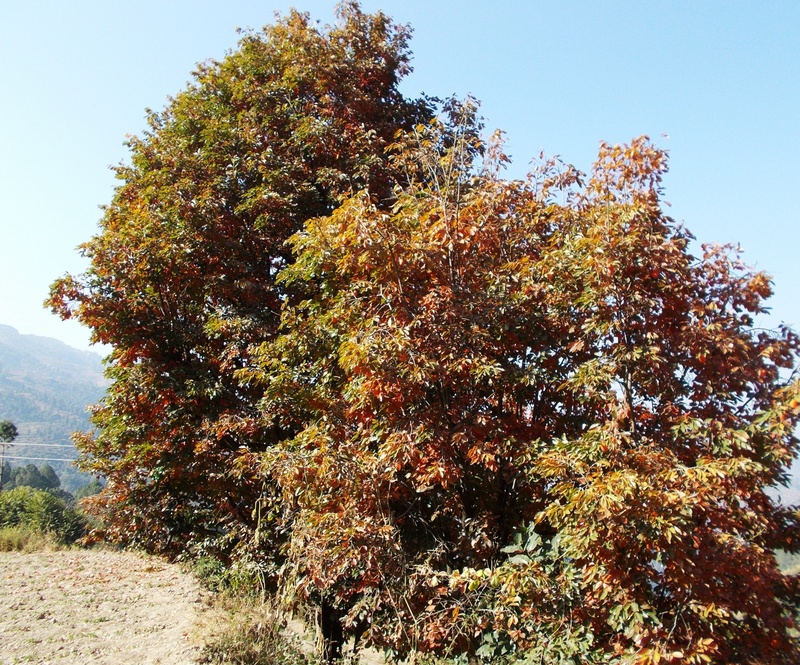 From nearby Pauri. He did mention the name of the place but we forgot it. Anyways, at that first time we were only able to take 7 kilos because the rest of them were not good...rotting (sadly, not many knew the fruit and somehow people don't have the 'let me try this' kind of mentality and apparently, they seem to have an aversion towards eating fruits). For Rs.50 per kilo, we took home 7 kilos, most of them were already ripe and ready to eat. Before we left, we took the shopkeeper's phone number and my husband did some arrangements with him. It was agreed that when the next batch comes, he would send us 20 kilos of properly selected persimmons. 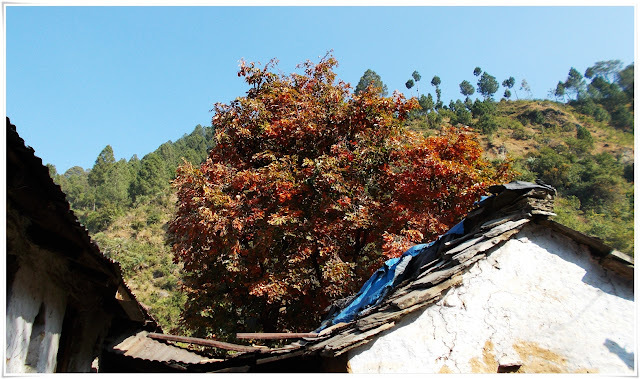 And so, after 25 days, I think, Suresh, our regular taxi guy, got us two boxes of persimmons from Pauri. Payment was made a week later when we went for marketing using Suresh taxi service. One year later, in a new place called Koteshwar which is around 100 kilometers to Pauri via Chakka - Devprayag - Pauri road, the same problem occurred. Nobody around here even knew the fruit. So as usual, I carried its photograph to show to shopkeepers hoping one or two of them will be able to arrange for us. In the meantime, knowing it's already persimmons' time, my husband rang the Pauri fruit shop to check if persimmons were available. Confirming, he said. And they've been in his shop for a week already. And so, an order for 30 kilos was talked and he has to call us a day before it arrives in his shop so we can arrange for its transport. Transport means, we will be hiring a taxi to go and get persimmons. This time though, we asked for the name of the place where persimmons were available. Two Saturdays ago, a call came from Himalaya Fruits. Persimmons were there! Right then, B arranged for a transport to go to Pauri. And so, at 8:30 the following day, he went to get 30, or maybe 40 kilos of persimmons. I didn't go because nobody was there to take care of Perci and Meegnu. Six hours drive plus a few more for packing and others, so more or less we would be gone for 8-10 hours minimum. So B went alone. But there was a detour. Around 5-7 kilometer before hitting the proper town of Pauri, the board 'Satekhal', the place that the Himalaya Fruits guy mentioned appeared on the road. So, they stopped and asked around. Luckily, one man was familiar with the fruit and knew someone who had the tree, but he wasn't sure if fruits were still there. He called the guy, nonetheless. It turned out, his was empty. But, this guy knew someone else who also had the trees. He rang him and, fortunately, his trees were still full of persimmon fruits. He then sent his son to accompany B and the driver. He even warned B to wait and let them do the harvesting because the village had no motorable road. But, no! B and the driver trekked for a kilometer uphill, saw the trees, climbed to pluck them, and took some pictures. They helped in packing, too! One of the guys who owned a tree of persimmons shared his story about how no one wants persimmons. He said that a month back, he and another guy took about 100 kilos to a Mela in Dehradun. In the morning, they were selling persimmons, freshly harvested but unripe, for Rs. 20 per kilo. Many people inquired about it. When it was told that the fruit isn't ready to eat yet, that it has to be kept for a week or more to ripen since it has to be fully soft, people rejected the idea out rightly. They waited. And so, towards the end of the Mela, about afternoon, they dropped the price to Rs.10/kilo. And guess what. NOBODY bought it still. I mean, it is a fact that somehow many people have an aversion towards fruits up to an extent of avoiding them because they cause diabetes when, if they really take a thought of it, fruits are hardly (to nil) part of their diet. But for a fruit that was sold for as cheap as Rs.10 per kilo, isn't it worth a try to buy one kilo to see how it is? burger, chips, etc. these same people would not even have a second thought of stuffing those into their mouths. So, I guess, this unpopular culture of fruit-eating has to change. And I can see that it has already begun. Most people are not just aware. Anyway, they ended up taking 50 kilos of persimmons back home. 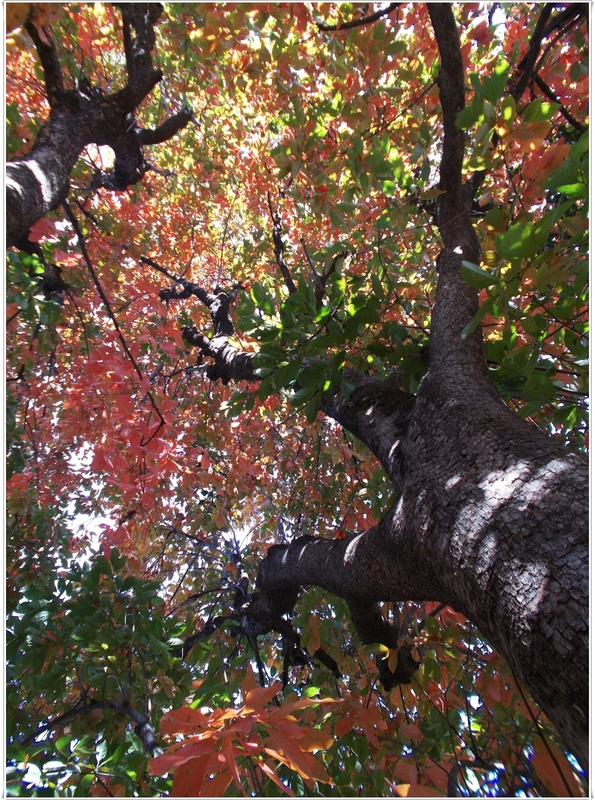 Persimmon trees yield less at first and then as it grows older the yield increases. 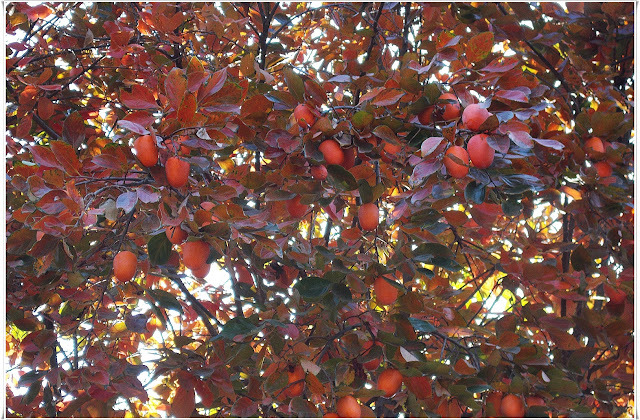 The tree above is around 50 years and this variety of persimmons, small, tomato-like, not every fruit has seeds. In fact, seeds in fruits are rare. According to the man who tends this tree, from whom B took persimmons, the roots creep underground and a few meters away from the main tree a sapling grows to become another tree. And so on. So the picture below must be like that. B ended up taking 44 kilos from this farm and Kishan, the taxi driver, took 6 kilos for his family. Kishann, however, regretted he only took 6 kilos later on and suggested to come back a week or two to get more. Because B told the Himalaya Fruits guy that he would come, before heading home they went to his shop at Pauri town. The guy was selling it for Rs.80 (the same fruit but not from the same guy whom B bought for Rs.15/kilo). B got it reduced to Rs.40/kilo and as a formality, he took 6 kilos more to make our persimmons from Pauri 50 kilos in total. He also took some other stuffs from the fruit guy like Californian grapes which was sold for Rs.600. B took a kilo and paid Rs.400/kilo for it. Some pears were also bought. This is how the small variety of persimmons look like in half -seedless, juicy, and sweet. It has sweetness different from the Himachal variety (capsicum-like, with seeds). 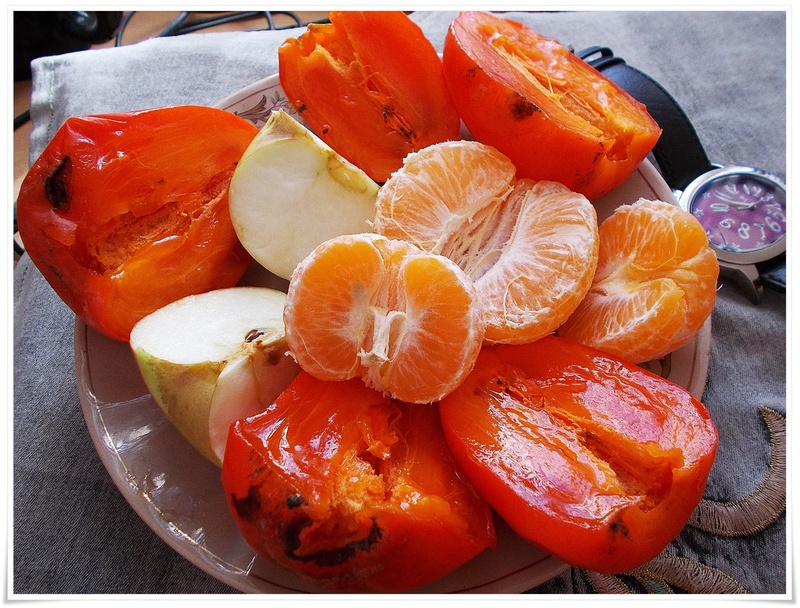 Persimmons are absolutely divine fruits. It's no wonder it's called Ramphal. It is, indeed, fruit for the gods! Never miss persimmons every year. I know we won't as much as possible. Buy it hard, keep it at home. Wait. Check. Eat. You'll never regret you bought it.